More light and openness, the latest appliances, and a richer color palette give this kitchen in a 1950s Eichler tract house new life while preserving its midcentury-modern character. With a few subtle changes―done without altering the floor plan or developer Joseph Eichler’s basic post-and-beam aesthetic―architect Anne Phillips transformed the space into something fresh and lively. Owners Janet Cole and Deborah Abraham wanted a greater sense of spaciousness, so Phillips removed a non-load-bearing partition and a little buffet counter positioned between the kitchen and the living area. This change made it possible to create a built-in breakfast table for two. 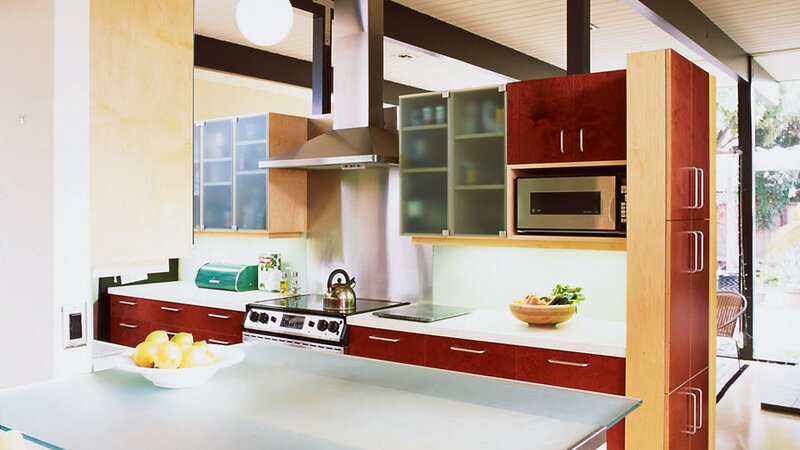 Etched-glass doors for the upper cabinets showcase the softened silhouettes of dishware in a contemporary way. Architect Anne Phillips kept her design simple, making sure that it complemented the architecture. Here’s how she approached the design. Increase daylight. A new backsplash-to-ceiling window behind the sink visually expands the space. Unify. Glass ties everything together: etched glass for the breakfast counter and the upper cabinet fronts, wire glass for the backsplash. Add sparkle. Stainless steel appliances, sink, and hardware catch the light. Enhance the wood. Light and dark tones of prestained plywood give the cabinetry an elegant, contemporary look. Accentuate the structure. Beams painted dark purple draw the eye. Brighten the background. The off-white laminate and ceiling reflect light. Add light fixtures. Undercabinet strip lights and track-mounted low-volt fixtures supplement the kitchen’s original globe pendant lights, reinforcing the room’s outlines.